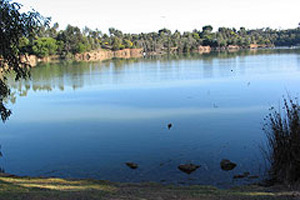 Once upon a time a former rubbish tip and quarry site was transformed into a fabulous lake surrounded by native bushland in the middle of Newport. Now known as Newport Lakes Park located off Margaret Street, Newport. A wonderful inner suburb sanctuary fit for a leisurely self guided walks. The nature trails span two kilometres around the lake, and range in length. You can choose the direction you want to go in, there are four trails each representing a bird mosaic as markers, look carefully though or you'll miss it. Some pathways are a little steep and covered with concrete gravel, so be cautious, it may be slippery and most definitely not suitable for people with mobility difficulties. Once you're in this space it's magical, like being in another world. So peaceful and on certain days you can smell eucalyptus and other fragrant fauna. You might see a duck or two and hear at least one of the 85 species of birds recorded there. Dogs are prohibited from entering the lake but may be exercised on or off leash in Pavey's park, opposite the Nursey. That's where I go to let my dog run and chase the magpies that always swoop down on him. The park is 33 hectares with two playgrounds on either side. It has toilets, drinking taps and free electric barbecues, ideal for picnics with family or friends. Lots of dogs come here too, so it's great for a doggy day out with plenty of waste bags at your disposal. The public car park is open daily from 7.30am to dusk and is open to visitors on foot at all hours. If travelling by public transport, the park is about a 15 minute walk from Newport Station.